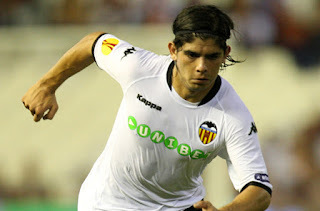 Ever Banega has suggested through the social networks that he wants to stay with Valencia CF. You all remember that Ever Banega tweeted near the end of the season how he would look at offers this summer, he then went on to describe that tweet as a joke to a friend and now he says he wants to stay at Valencia CF, has no problems with anyone at Valencia CF and wants be be at Valencia CF for a long time. Well the thing is he has been seen drinking and staying up late in the morning hours numerous times, he has been seen smoking, he has been hanging out with trouble boy Chori Dominguez and has openly written he will look at offers to leave Valencia CF this summer. Now the tables have turned and Valencia CF is looking to offload him, so they are going to use the Copa America 2011 to have Ever Banega's price increased. 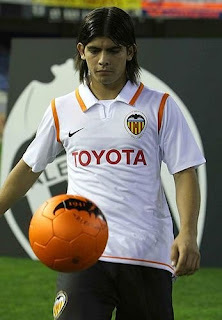 Is there a possibility that Valencia CF does not sell him? - Yes there is a small chance that he may stay with Valencia CF, but it will all depend on how much Valencia CF spends on reinforcements. Do you remember when I reported 7-8 months ago that Valencia CF would have around 16 million euros for reinforcements depending on where it will finish in the Champions League this summer? - Well as you can see Valencia CF has already spend 3 million on Diego Alves, 6 million on Daniel Parejo and that means Valencia CF is left with 7 million euros more for transfers. I mean maybe at max we are left with 10 million euros to spend, but that is very unlikely so Valencia will need to sell, otherwise we would be going in the red in the transfer market, for the first time in 3 seasons actually. I don't think the decision has been taken that Ever Banega will be sold 100%, but chances are its very, very likely he is going to be sold. Evidence of this is that Llorente and Braulio just promised at the Rami presentation that they are looking at signing two more defenders, so that would mean Valencia is likely to spend more than 10 millions euros going forward.